The Classic style is a time honored tradition. This jacket features a premium 24 ounce wool body, rib knit stand up collar, rib knit cuffs, and knit waistband. Top grain cowhide leather sleeves and pocket welts. Set in sleeves or request Raglan sleeves at no extra cost. Jacket features a quilted lining. There are 7 front snaps down the body. 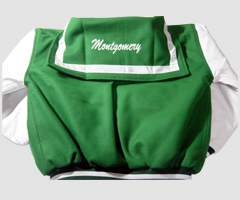 You can have a Hidden zipper panel if you plan to have your locale embroider decorate you jackets plus $15.00 Ask us about our volume discounts and other options. The Retro style jacket is a new twist on the old classic. This jacket features a premium 24 ounce Melton wool body and sleeve. There are two leather inserts on the body of this jacket. The underside of the collar also is made from the premium top grain cowhide. The pocket welts are also leather. The cuffs and waistband are Rib knit. Futures a quilted lining or a light weight nylon lining . 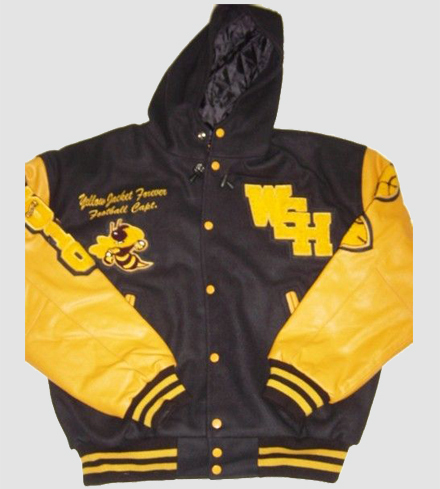 You can have a Hidden zipper panel if you plan to have your locale embroider decorate you jackets plus $15.00 Ask us about our volume discounts and other options. 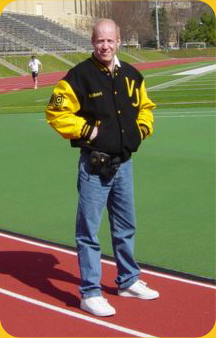 The Sailor style is a favorite of Marching bands and cheer squads. Made from the Same 24 ounce Melton wool. Features are all the same as the classic style but with the square collar. You can have a Hidden zipper panel if you plan to have your locale embroiderer decorate you jackets plus $15.00 Ask us about our volume discounts and other options. The hoodie is our newest style and . has all the same great features of the classic style but with a added wool hood. This style will keep you warm all season. You can have a Hidden zipper panel if you plan to have your locale embroiderer decorate you jackets plus $15.00 Ask us about our volume discounts and other options. 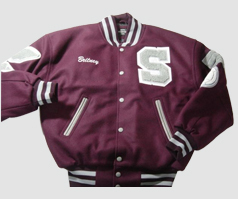 The all wool style varsity jacket is a favorite of Marching bands and cheer squads. Made from 24 ounce Melton wool. This jacket Features are all the same as the classic style but with the sleeves in wool. You can have a Hidden zipper panel if you plan to have your locale embroiderer decorate you jackets plus $15.00 Ask us about our volume discounts and other options. This new fitted varsity letterman jacket is a favorite of our UK customers who want a more fitted tailored look Made from 24 ounce Melton wool. 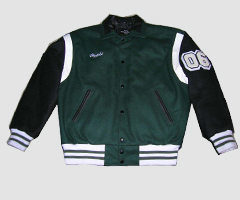 This style jacket varsity letter man Features are all the same as our classic style. You can have a Hidden zipper panel if you plan to have your locale embroiderer decorate you jackets plus $15.00 Ask us about our volume discounts and other options. This sport style is is our newest style and . Made from a 24ounce Melton wool and top grain cowhide leather. 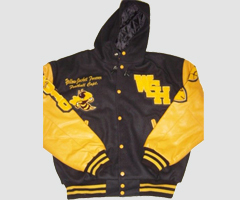 This is the newest style and most innovative style varsity letterman jacket on the market today! Designed by Robert Schiloni. It is fast becoming the new rage for bands and cheer squads and drill teams for competions all over the world. 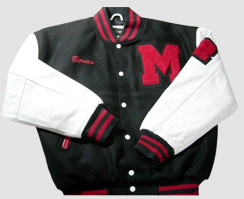 This style varsity letter man jacket Features are all the same as the classic style but with the Crop style fitted body and sleeves. 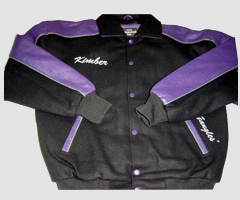 You can have a Hidden zipper panel if you plan to have your locale embroiderer decorate you jackets plus $15.00 Ask us about our volume discounts and other options. When only the best will do. 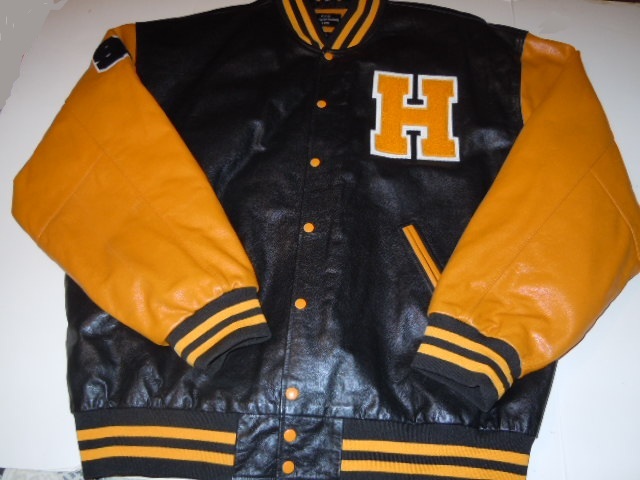 l We us only the best cowhide leather in all our full leather Varsity style jackets. This jacket features a quilted lining and two outer pockets. There is a inside pocket for your cell phone or glasses. 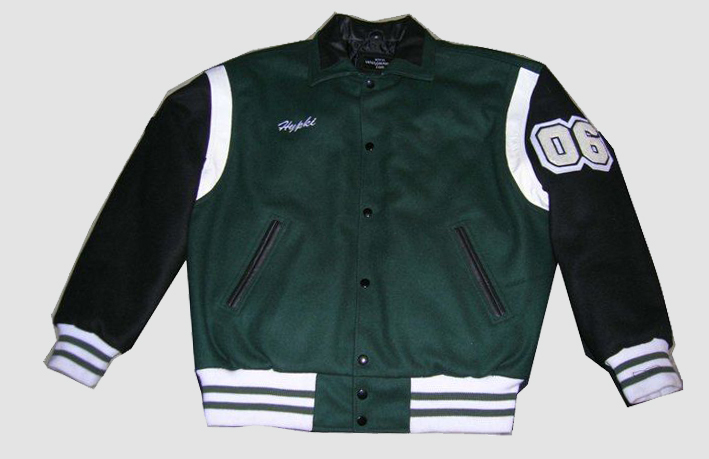 This style varsity jacket can be customized with embroidery or custom chenille patches.